Halo is a sci-fi action game of epic battle, exploration, and discovery. Players wage a high-tech guerilla war, on foot, in vehicles, in the air and beneath the surface of an alien ring construct. working sometimes in concert with other AI characters, but more often alone, you must improvise to survive your fight against an overwhelming and heavily armed alien force. Hundreds of years from now, Earth's fledgling planetary empire has been drawn into a merciless war with a consortium of alien races known as the Covenant. Covenant technology is far beyond that of Earth, and the humans are losing. Whole planets are being destroyed. Billions have died. It's only a matter of time before the Covenant find Earth, and destroy it. The most recent human planet to be discovered by the Covenant fleet is Reach, population 700 million. The Covenant annihilate it utterly. A single human corvette escapes the battle. In a desperate attempt to lead the Covenant away from Earth, the ship charts a course for a distant unexplored system. In a move that baffles the Commander and her crew, the entire Covenant fleet gives chase. When the humans arrive at their destination, they find an alien artifact of enormous size in orbit between a gas giant and its moon. They have found HALO, a ring ten thousand kilometers in diameter, with a breathable atmosphere. On its inner surface, HALO has oceans, continents, varied climatic zones. It's a habitat. The Covenant destroy the human ship in a battle near HALO, but a portion of the human crew escapes to land in scattered groups on the surface of the ring. One of the marines, more skilled than the rest, starts a guerilla war against the Covenant, trying to stop them from learning the secrets of HALO. This marine is you. The game begins. Halo breaks with the dominant game paradigm of level-oriented play by introducing a world of continuous action- there are no breaks. You roam under, above and beneath the surface of a far-off world populated by three different alien cultures. Players assume the role of a human military recon unit sent to thwart the efforts of aliens seeking to crush human expansion into space. On the surface of an ancient ring construct in space, the human player must fight off assaults over the sea, land and air. Halo takes place on an artificial Ringworld-style planet orbiting a gas giant in another system, much like the vision of Larry Niven's Ringworld universe. The setting is part of the core mystery of the game, with the creators and builders of this world -- and its accompanying wonders -- long gone. While exploring the planet, humans have found new technology that we just have to have, even at the cost of lives. To complicate matters, another alien race is bent on obtaining this technology, and both races must fight to achieve dominance in this system. In Halo, you assume the role of an armored cyborg scouring the surface of a gigantic alien artifact- a habitable ring in space 10,000 miles in diameter. The artifact contains alien weaponry and technology that you can use to help save the human race from extinction at the hands of the Covenant, an intermingling of three different alien species bent on preventing mankind's conquest of space. As for the game's story line, the player is cast in the role of a futuristic soldier, a member of an elite military reconnaissance unit that is trying to flee from a technologically superior alien armada. After landing on a huge ring construct located deep in outer space, the player must work in conjunction with other members of his team to defeat the alien onslaught and secure the all-important construct. The story is set in the far future, where humankind is waging a losing battle with a race of strange alien invaders. The discovery of a massive ring in deep space offers an opportunity to tip the balance of the war in favor of the race that manages to lay claim to it. The inside of the ring is an entire world (fans of Larry Niven's Ringworld books will recognize the influence immediately), an ancient artificial environment constructed by a superior race, and the primary battleground in Halo. Bungie plans to allow the player to discover things to do through exploration, or be given mission objectives by a sentient computer on board their mother ship, and the player will generally have several courses of action to choose from at any given time. Halo is a third person combat game where you are a military recon unit of the fledgling human empire. Chased by aliens, you land on a gigantic alien-made ring world much like that of Larry Niven's Ringworld novels. The construct encircles a star with a gravity effect gained through centripetal force pushing you into the inside of the spinning ring. In the single-player game, you are responsible for organizing and leading a resistance effort against a vicious alien enemy. The details of the game are still being worked out (as are most details, actually), but so far it's known that you play a cyborg warrior deep in a guerilla war on a distant ring construct far from Earth, fighting an alien covenant bent on your destruction. The aliens from the trailer are actually only one a few species to appear in the game, and non-cyborg humans will make an appearance as well. Most of the game will take place on the massive ring world, which you can actually see rise up into the sky and loop around in the far distance from planetside. A single player adventure will take you on a third-person journey through the world, piloting sea, air and land vehicles in attempt to fight off the alien onslaught. The basic premise of Halo centers around two races: a group of humans and an alien race known as the Covenant - both races have crash-landed on a large ring floating around a large gaseous planet. The races are distinctly different from each other and have separate designers making sure they look nothing like one another. The large, ominous aliens move with smooth, fluid movements and use energy weapons like blasters to take down their human opponents. Humans wear military combat suits and use melee and propelled weapons. Also, the ring encircling the planet was constructed by a third and as yet unseen alien race, but Bungie wouldn't comment on whether we'd be able to see or fight against that race when the game is complete. We wanted to make the definitive game of conflict between the human race and an alien civilization. There have been countless games on this theme, but few of them have the depth of story, detail or originality that you would find in a good sci-fi novel. We're going to write this story, and bring it to life with the best technology available in an electronic game. One of the things that was most rewarding about the Marathon series was the way that fans pored over the details of the story, analyzing and debating it, and eventually expanding it beyond what we originally had written. Two years after we shipped the third in the series, Marathon Infinity, we could still check out third-party sites to find out the new developments there were in the Marathon world -- it was a blast. That taught us that a complex story reaps benefits long after players have played through the game, and that's very much our intention with Halo. It's worth noting that though Halo takes place on a ring-shaped artificial world, the story, characters and world bear no relation whatsoever to Niven's excellent Ringworld novels. Halo pits a small military unit against the overwhelming forces of the alien Covenant. As our plucky heroes try to evade the creatures, they discover a bizarre ring-shaped world with a natural environment along its inner edge. You have to fight both gangs of aliens and the planet's own secrets if you're going to survive. It's set in a future in which the human race is on the run from a ruthless alien race called the Covenant. As billions perish on humanity's colonized planets, a human military unit decides to make a last stand on an ancient ring-shaped structure thousands of miles in diameter. The surface of this bizarre stellar body is a lush natural environment. It's on this "halo" that mankind will stage its greatest battle. The setup for the game goes something like this. A space-faring transport vessel carrying about 1,800 humans, 800 of them marines, crash-lands on a huge ring-world that orbits a distant star. A theoretically feasible sci-fi construct, a ring-world is a thin ring of planetary mass thousands of miles across, with an inner surface coated with desirable life-supporting essences such as an atmosphere, soil, trees, and water. Because of the ring-world's unique halo orbit at the Lagrange Point between a gas giant and one of its moons, this freakish world actually spins in place, with the resultant inertia creating an effect similar to gravity (remember the space station in 2001: A Space Odyssey). An impressive artifact of tremendous significance, the ring appears to have been mysteriously abandoned by the time your ship crash-lands on the surface. But, much like a leftover slice of pizza at the PC Gaming World offices, this kind of phenomenon fails to go unnoticed for long. An alien race called the Covenant soon pops up. Technologically superior to humans, these humanoids show up in great numbers to pilfer what they can from the ring. As you might guess, a full-scale war erupts between the humans and the Covenant. Since the humans are ill-equipped to face the Covenant head on, their only hope is to use guerrilla tactics. Given this fact, at times you'll be able to use all the alien's weapons and vehicles against them. The other big problem you'll face in the early parts of the game is that all your mates and gear gets spread out over the ringworld in the chaos that precedes the crash. The story of the game revolves around a future world where the human race is constantly on the run from an alien race called the Covenant. As the covenant are eradicating entire colonies or planets of humans, a military unit decides to fight back to save humanity. These human soldiers will take their last stand on a stellar ring thousands of miles in diameter. The surface of this ring has a very lush natural environment. It's on this "halo" that the game takes place. Halo is a 3D action game set in a distant future where mankind is being exterminated by a fearsome alien enemy called the Covenant. A group of human space marines is going to take a stand on a ring-shaped world (the "Halo" to which the game's title refers, and an admitted nod to Larry Niven's science fiction classic Ringworld). For those of you who don't know the storyline behind the game, Halo takes place on surface of a giant Ringworld similar to the one portrayed in Larry Niven's sci-fi epic of the same name. This ring orbits a huge gas giant and if you flick your eyes around Halo's sumptuous skies, you can already see a couple of gorgeous moons and the giant ring curving away into the middle distance. The storyline underpinning Halo is now taking shape, and portrays you as a power-armoured human warrior who was part of a fleet being chased by a enormous armada of aliens known as the Covenant who are sweeping their way through human space and destroying civilian worlds at will. Your fleet commander makes the momentous decision to try and lead the aliens away from Earth and lures them out into a remote corner of the galaxy where you are forced to crash land on a moon that is orbiting the enormous Ringworld. With most of the main action concentrated on the Ring's main surface, in the course of the conflict you soon discover that the Ringworld holds much more than it seems and contains technology which could ultimately decide the course of the war. The storyline for Halo is, as with many other similar sci-fi action games, one contrived to place you as a cyborg warrior on an alien world. An alien horde known as the Covenant is ploughing a destructive path through one planet after another, and the human homeworld lies next in its path. In an attempt to save the billions on Sol, its leader sends a decoy force off to a remote corner of the galaxy. The decoy force draws the Covenant away successfully, but in its attempt to escape crash lands on a mysterious ring world orbiting a gas giant called Threshold. The ring is 10,0000 kilometers wide, shaped like a thin bracelet, yet despite denying the known laws of physics it has a breathable atmosphere and a variety of climates (snow, tropics, tundra etc), as well as life forms of its own. The ring, or Halo as it's named, is where you'll have to salvage what you can from the crashed ships, and make a stand against the Covenant. The game takes place on a metal halo circling a gas giant. Constructed by an unknown race, the ring contains an entire ecosystem and just over the horizon you can see the halo stretch off in the distance. Their [sic] is one small problem it is drifting in to the planet's gravity well. To complicate things more a human expeditionary force and an alien race know as the Covenant want to control the ring. The title refers not to angelic iconography, but to the player environment, a 10,000-mile diameter ringworld in a halo orbit around a gas giant. Your crack cyborg unit crash-land on its inner surface while leading the alien Covenant away from the planet Earth as they swarm across the galaxy like genocidal space locusts. In a classic scenario, reminiscent of Doom, your unit makes a last stand in the bizarre celestial arena of the ring. Determined initially to just take a few of the bastards with you, there is (of course) an "engrossing cinematic sci-fi story" unfolding, details of which are yet to emerge with the game half finished. Played entirely as a third-person action game the story of Halo thus far follows the tale of the player assuming the role of a cyborg part of a millitary recon unit that has landed on a massive habitable ring world that is 10 000 miles in diamater. Chased by aliens known as the Covenant (an alliance of three races) the player must use guerilla tactics and what little weapons he possesses to work with his crew to lay claim to this massive ring. The premise is that the race that occupies this piece of rock in space is likely to win the war that is raging between humans and the Covenenat. It's imperative that in this near future you and your crew succeed in warding off the aliens who out-number you, and out-gun you as in the whole grand scheme of things the humans are fighting a losing war. The Time: Sometime in the future. The Place: A mysterious planetary system. The stakes: Life or death. The human race has advanced leaps and bounds. We are now placing outposts on distant inhabitable planets, in preparation for mass colonization. Then one day, one of these outposts recieves a strange message. It is not until the originators of this message attacks that we know what it means. They are called the Covenant, and they strike through our colonies with striking speed. Their technology does not seem to be too far advanced from ours, but their numbers are. We amass our forces at Earth, preparing for their imminent assault. When it comes, we lose many, and in a last-ditch attempt, we send one of our final ships, the Pillar of Autumn, into subspace. Suprisingly, they follow. When we come out of hyperspace, we are suprised at what we find. There are three planetary bodies orbiting a nearby star. The first, a large gas giant, we name Threshold. Its moon we name Basic. But it is between these two planetary bodies that we find the most stunning discovery. A ring-shaped body holds its own between the other two bodies. Upon further research, we discover that this ring is orbiting Threshold, and that it's inner-body is inhabitable, and features gravity as well as climate systems. We name the ring Halo. As we prepared to conduct a first-hand investigation upon Halo, we were suprised yet again. A Covenant fleet emerged from behind Threshold. It appears that they already knew of Halo's existence. Another battle ensued, and again we were overcome. We prepared to abandon ship, and set course for Halo. We jettisoned our supplies, and launched the escape pods. Some 2600 of us survived, a few hundred being cyborg. Unfortunately, both the personel and the supplies were spread throughout the Halo. It is here we stand our ground...or die trying. Halo is named after the game's setting, a ringlike planet that's like a big hula hoop in space. A contingent of human marines crash-lands on the planet, and soon an alien species called the Covenant show up. The ensuing conflict between the humans and the aliens creates the game's backbone, as both sides struggle to seize control of Halo. 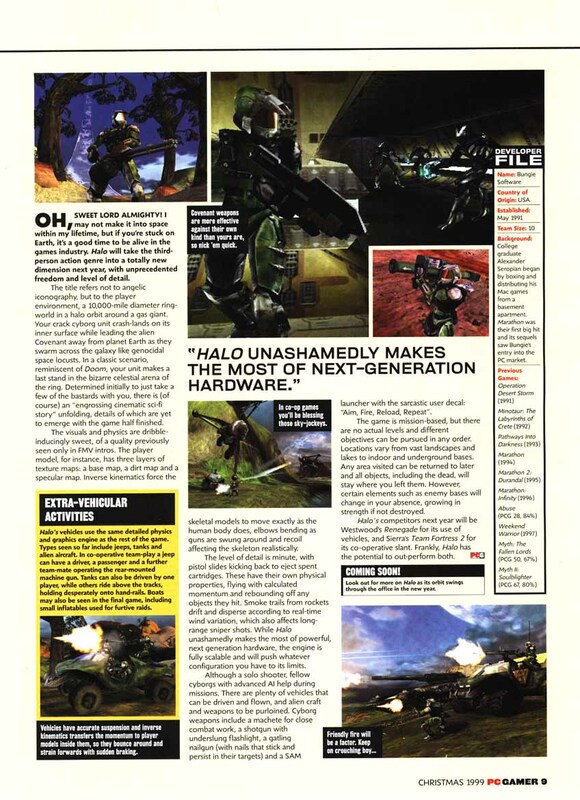 Halo is a team-based third-person 3D shooter, set in an exceptionally complex futuristic setting. Bungie has always been known for their intricate story construction, and Halo will be no exception. Many years into the future, mankind expands outward to colonize the galaxy, and encounters the classic consequence of interstellar expansion: an alien race that's at least as unpleasant as we are. Called the Covenant, they keep mostly to themselves, sending only short communications of oddly religious cast before blowing the hell out of human colonies. Eventually, there is a final confrontation, as the Covenant fleet approaching Earth is met by humanity's last line of defense...and unfortunately, we lose. The last surviving human ship, the Pillar of Autumn, decides to get the hell out of there, guided by its commanding artificial intelligence. Setting a random course for as far from Earth and the Covenant as possible, it makes its way to a remarkably strange planetary system. This system has three major components: Threshold, a gas giant planet; Basis, a small moon; and Halo, the really interesting bit. Readers of Larry Niven's Ringworld should have a handle on the basic concept, although the Halo sits at a Lagrange point between Basis and Threshold, rather than encircling a sun. Halo is a massive, ring-shaped construction, with a habitable environment covering its inner side; it has rotational gravity, an atmosphere, and so forth. And it's the Halo upon which the Pillar's last survivors crash, after the Covenant catches up to them. You are one of those survivors, bailing out of the ship with all the supplies and armament you can jettison in time. That's just the backdrop, of course, and many more elements should come to play in the game's story - things like the origins of the Halo and how Halo's story relates to Marathon's (the Bungie cognoscenti seem to have drawn a number of parallels). Is Halo related to Bungie's earlier Marathon series? Since February '99 Bungie have been sending regular cryptic "Halo related" emails to the Marathon's Story page, a venerable third-party Marathon fan site. The emails - (The Cortana Letters) - were allegedly from an entity known as Cortana and Marathon fans were eager to draw parallels between Cortana and the three AIs in the Marathon series (Durandal, Tycho and Leela). Cortana's name for example is similar to that of Durandal's - both are swords from the Charlemagne era. Cortana appears again on Bungie's Halo page and some parts of the Halo web site text are identical to that in the Cortana Letters. In the centre of the Halo logo there is a slightly obscured outline of the Marathon symbol (see above for an enhanced image). "There may be things in the story I haven't told you that might be familiar." "I'll say this: Observant fans of our games will note that certain themes tend to run through our games. For example, the sword Durandal (from the "Song of Roland") first appears in Minotaur as a magic sword and goes on to become a central character in Marathon. There are many other examples of common themes running through our games."